365. Sep 12, 2005. 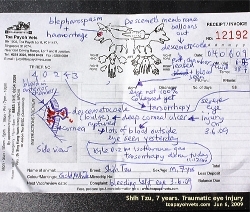 Deep eye ulcer healing. 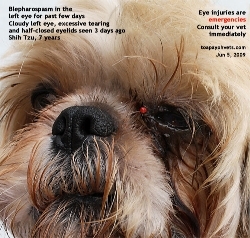 Shih Tzu had fever due to eye corneal infection. Need to control the fever. 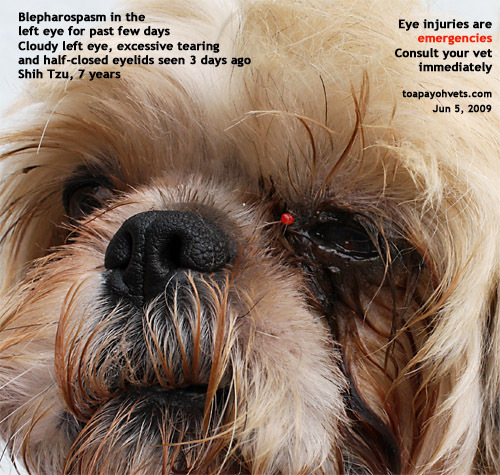 Shih Tzu puppy with eye ulcer 364. Sep 12, 2005. Back to basics. 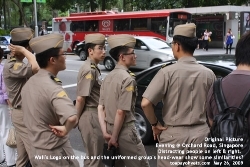 Do general examination. False alarm. No need Caesarean. Had rushed to Surgery. 363. Sep 12, 2005. Soft bed provided much appreciated by the puppy. 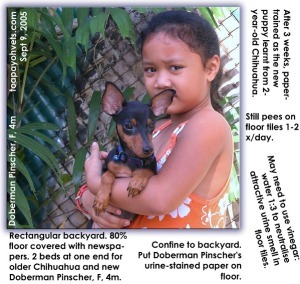 Sniffing all the time, not a good indicator of wanting to pee, the owner said. 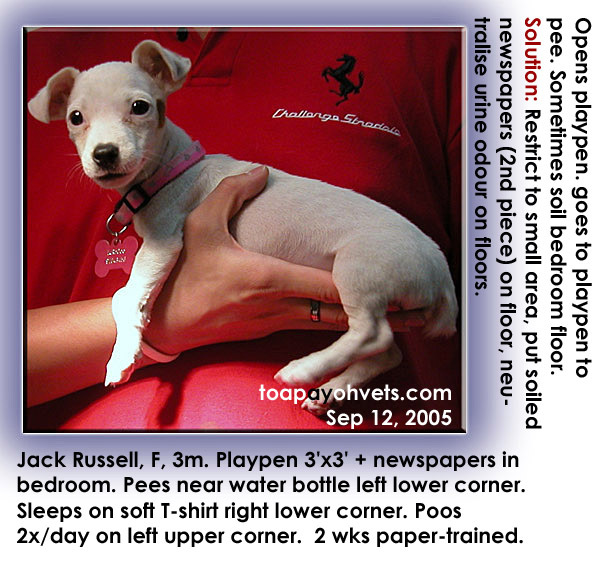 The shivering Jack Russell was paper-trained in 2 weeks. 362. Sep 11, 2005. Farts a lot. Stablise intestines. Deworm. 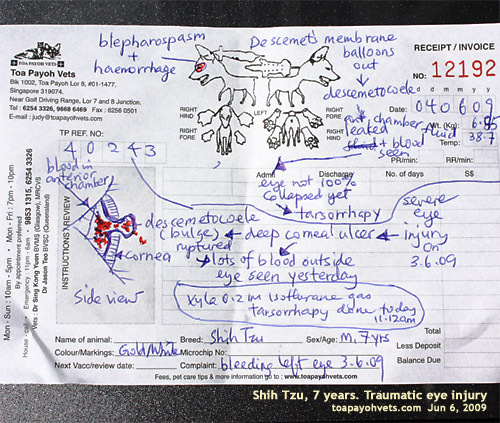 Review with vet again. 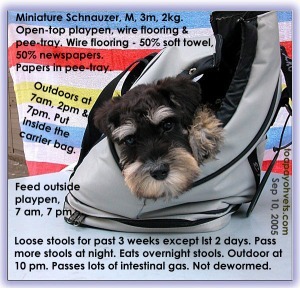 Indoor & outdoor toilet training. 361. Sep 11, 2005. Itchy puppy with bald body and dandruff. Consult your vet promptly. 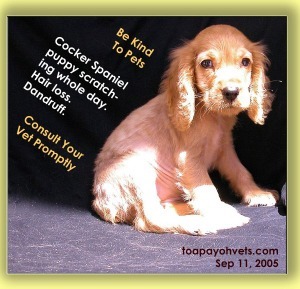 Training a biting 6-week-old Cocker Spaniel. 360. Sep 9, 2005. Prefers the shower room. Puppy may be looking for a cooler place (scratching ears many times a day) or den. The SilkieXSchnauzer prefers the shower room. 359. Sep 9, 2005. Learning how to use the toilet from an older dog. A restricted zone for the new puppy. 358. Sep 9, 2005. 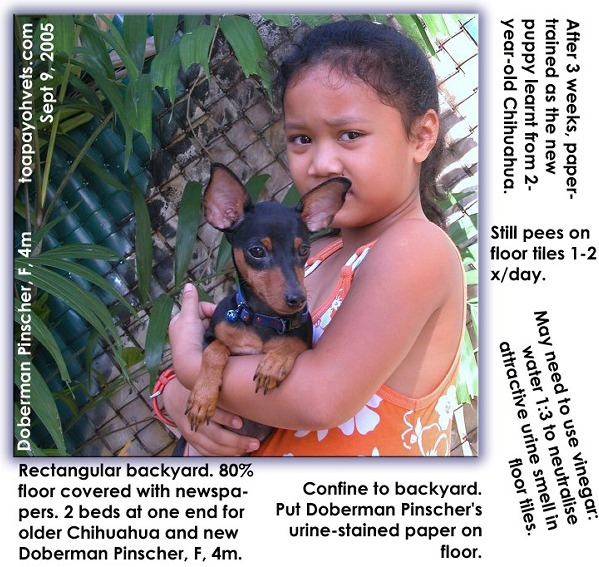 Strict isolation of the new puppy in the backyard is one secret to success in paper-training, the owner said. Beds provided. 80% floor covered with newspapers for first 3 weeks. A restricted zone for the new puppy. 357. Sep 9, 2005. Few Singaporeans realise that a den (carrier crate) is appreciated by the puppy. Door of den left open. Owner has the ideal set up for toilet-training but this configuration costs more. Thin. 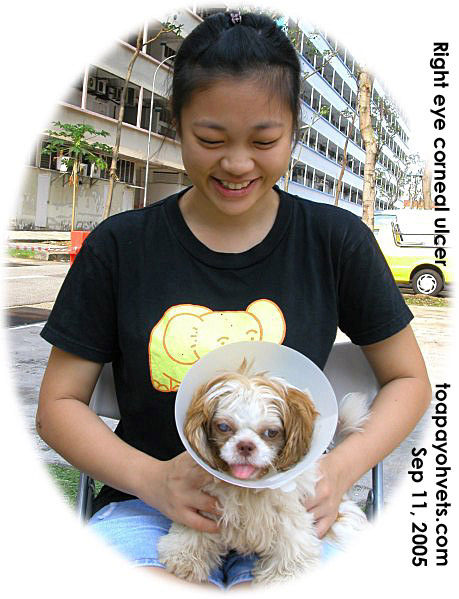 Vet advised 3x/day feeding and Elizabeth collar for prevention of eye scratching. 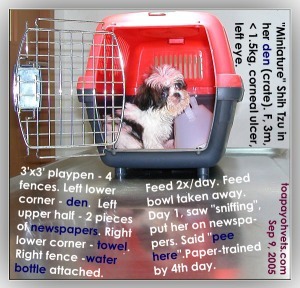 The "miniature" Shih Tzu was paper-trained in 4 days. 356. Sep 7, 2005. 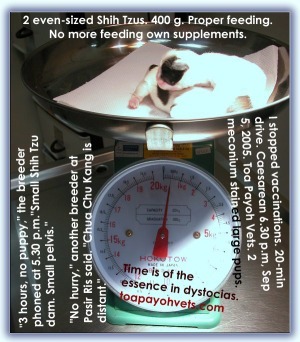 A Shih Tzu puppy is high maintenance. It needs daily grooming. An adult lady owner knows how to care for it. 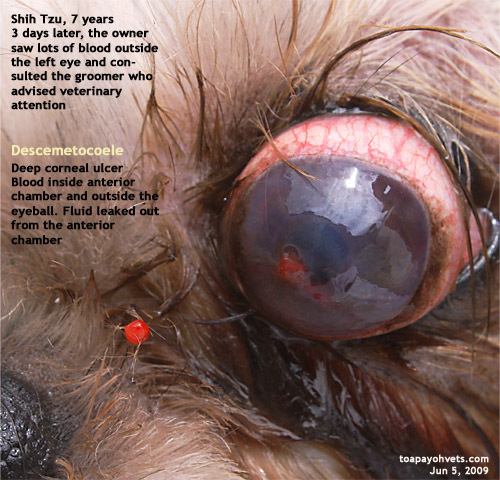 Finding a buyer who will care and love the Shih Tzu with the eye ulcer. 355. Sep 7, 2005. 5 just-ripe Jack Russells. Bottle feeding needed for first day. No milk. 354. Sep 7, 2005. Swinging the puppy is expected of any breeder, so I was shocked that this breeder could not do it. 353. Sep 7, 2005. 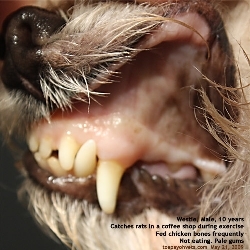 The breeder no longer supplements and experiments with breeding food. Good-sized puppies. 352. Sep 7, 2005. 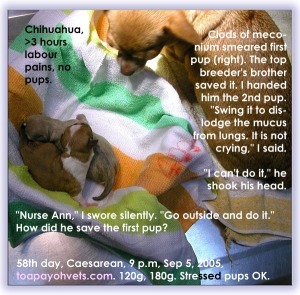 The Corgi growled at Nurse Ann. Tug-of-war games played by owner meant to show that he's the boss, according to the book. Best not to encourage aggression. Right hip pain, walks sideways past 4 weeks. Could be active lifestyle jumping and climbing. 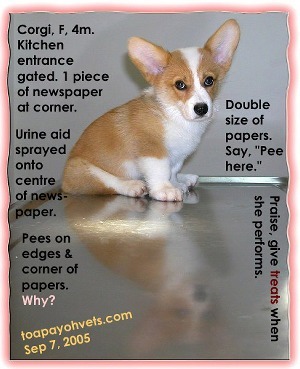 The Corgi pees at the corners of the papers. 2405- 2406. 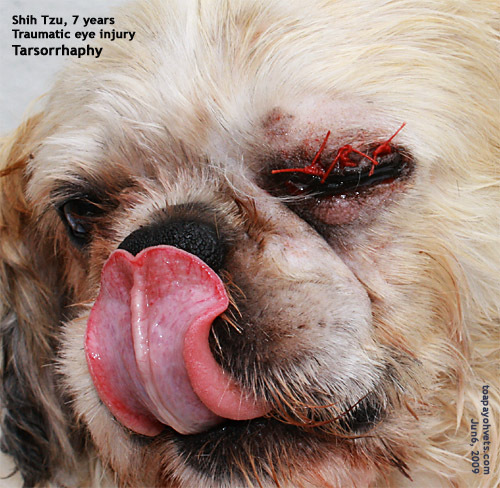 A very serious eye injury in a Shih Tzu in 2009. Deep corneal ulcer, blood in the anterior chamber, leakage of aqueous from the anterior chamber and descemetocoele. Likely to be blind. 2378 -2379. 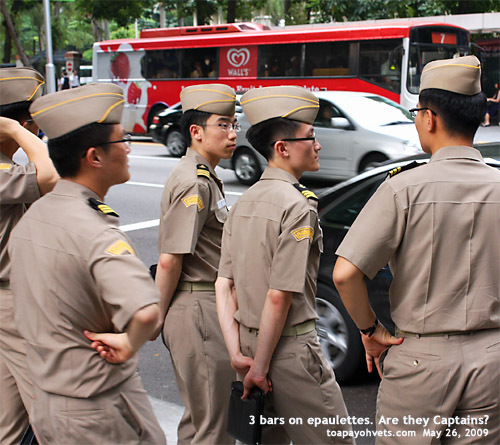 Cropping and removal of distracting people makes the a good picture of the young men in uniform. 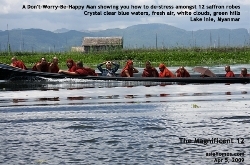 Wanted: 10 singles who are couples for a scenic Lake Inle Tour, Myanmar.